I said that I made that sweater last year, and then I realized last year was only a little over a week ago. What happened to 2007? I can’t believe it went so fast. Time flies like an arrow. Sorry about that. Just couldn’t resist. I have heard from #1 Son. Phone calls have not been attempted, but email, it turns out, is possible between Brazil and Portland. He is having a wonderful time. The food is great. The weather is wonderful. The people are beautiful and friendly. He’s having the time of his life. Yesterday he forgot to put sunscreen on his feet and ankles before lounging around on the beach all day. Ouch. I so wish I were with him. Think of it. Sunshine. Warm weather. There is none of that, here. Here it is winter. Cold and drizzly and gloomy. In Brazil it’s summer. Having your mom tag along on your punk band’s tour would probably be limiting, though. 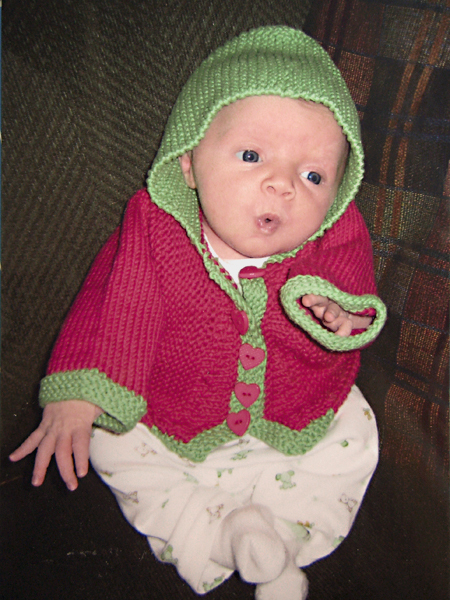 This is proof that I have been knitting, although I don’t seem to have been blogging about it lately. I’m about 1/2 finished with the first wing of the Wings Of A Dream shawl. 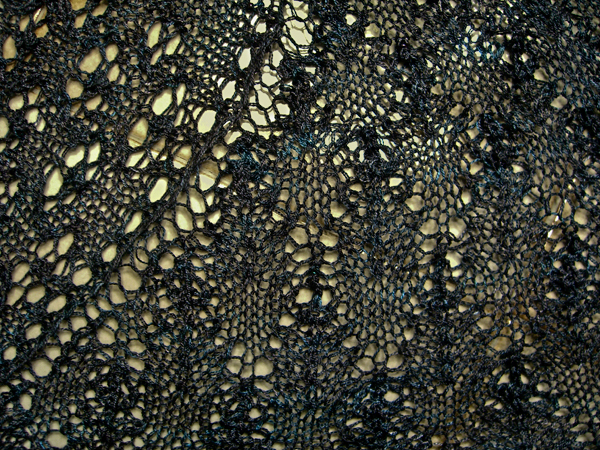 Like all lace, it looks a bit wonky and weird until it’s blocked — sort of The Great Black Glob-ish. But when I stretch it out, I’m happy. It’s going to be really pretty, I think, when it’s finished. It’s really hard to capture the true color of this yarn. Sometimes it’s black. And sometimes it’s blue. And sometimes there are hints of turquoise. If you pop up the biggy size picture, you’ll see glints of bluish color. Silk has such a pretty sheen, too, doesn’t it? I loves me some silk, gentle reader. Now I’m starting to worry that I won’t have enough yarn. I should have enough. I planned to have enough. But it’s a little hard for me to judge how much I have left vs. how much I’m going to need to finish this wing and knit the other wing. If it turns out that I don’t have enough, all I can do is order another skein and keep my fingers crossed that the color is reasonably similar to what I already have. But I’m double-stranding, so that should help. Maybe. One more thing to worry about. This post feels disjointed to me. I went back to work today (yesterday, now) after two whole weeks off. I’m still in shock. No doubt I’ll acclimate all too soon.